As seen with electron microscope, the basement membrane is composed of two layers, the basal lamina and the underlying layer of reticular connective tissue. The underlying connective tissue attaches to the basal lamina with collagen VII anchoring fibrils and fibrillin microfibrils. The two layers together are collectively referred to as the basement membrane. The basal lamina layer can further be divided into two layers. The clear layer closer to the epithelium is called the lamina lucida, while the dense layer closer to the connective tissue is called the lamina densa. The electron-dense lamina densa membrane is about 30–70 nanometers thick, and consists of an underlying network of reticular collagen IV fibrils which average 30 nanometers in diameter and 0.1–2 micrometers in thickness. In addition to collagen, this supportive matrix contains intrinsic macromolecular components. The lamina densa, whose collagen IV fibers are coated with the heparan sulfate-rich proteoglycan perlecan, and the lamina lucida (made up of laminin, integrins, entactins, and dystroglycans) together make up the basal lamina. Integrins are not part of the basal lamina, they are part of desmosomes which are in the basement membrane but not the basal lamina. 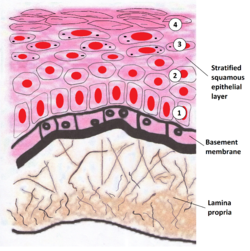 The primary function of the basement membrane is to anchor down the epithelium to its loose connective tissue (the dermis) underneath. This is achieved by cell-matrix adhesions through substrate adhesion molecules (SAMs). The basement membrane acts as a mechanical barrier, preventing malignant cells from invading the deeper tissues. Early stages of malignancy that are thus limited to the epithelial layer by the basement membrane are called carcinoma in situ. The basement membrane is also essential for angiogenesis (development of new blood vessels). Basement membrane proteins have been found to accelerate differentiation of endothelial cells. As of 2017 many other roles for basement membrane have been found that include blood filtration and muscle homeostasis. Some diseases result from a poorly functioning basement membrane. The cause can be genetic defects, injuries by the body's own immune system, or other mechanisms. Genetic defects in the collagen fibers of the basement membrane cause Alport syndrome and Knobloch syndrome. Non-collagenous domain basement membrane collagen type IV is autoantigen (target antigen) of autoantibodies in the autoimmune disease Goodpasture's syndrome. A group of diseases stemming from improper function of basement membrane zone are united under the name epidermolysis bullosa. ^ Kierszenbaum, Abraham; Tres, Laura (2012). Histology and Cell Biology, An Introduction to Pathology (3rd ed.). Elsevier. ISBN 978-0-323-07842-9. ^ Paulsson M (1992). "Basement membrane proteins: structure, assembly, and cellular interactions". Crit. Rev. Biochem. Mol. Biol. 27 (1–2): 93–127. doi:10.3109/10409239209082560. PMID 1309319. Archived from the original on 2007-10-13. ^ Noonan DM, Fulle A, Valente P, et al. (December 1991). "The complete sequence of perlecan, a basement membrane heparan sulfate proteoglycan, reveals extensive similarity with laminin A chain, low density lipoprotein-receptor, and the neural cell adhesion molecule". J. Biol. Chem. 266 (34): 22939–47. PMID 1744087. ^ Liotta LA, Tryggvason K, Garbisa S, Hart I, Foltz CM, Shafie S (March 1980). "Metastatic potential correlates with enzymatic degradation of basement membrane collagen". Nature. 284 (5751): 67–8. doi:10.1038/284067a0. PMID 6243750. ^ Kubota Y, Kleinman HK, Martin GR, Lawley TJ (October 1988). "Role of laminin and basement membrane in the morphological differentiation of human endothelial cells into capillary-like structures". J. Cell Biol. 107 (4): 1589–98. doi:10.1083/jcb.107.4.1589. PMC 2115245. PMID 3049626. ^ Pozzi, Ambra; Yurchenco, Peter D.; Iozzo, Renato V. (January 2017). "The nature and biology of basement membranes". Matrix Biology. 57-58: 1–11. doi:10.1016/j.matbio.2016.12.009. PMC 5387862. PMID 28040522. ^ Henig, Robin Marantz (February 22, 2009). "What's Wrong With Summer Stiers?". New York Times. Archived from the original on November 9, 2016. ^ Janeway, Charles; Janeway, Charles A. (2001). Immunobiology (5th ed.). Garland. ISBN 978-0-8153-3642-6.